Scrambling to the classical roof of Interlake School (now the Wallingford Center), a photographer from the old North Central Outlook recorded the intersection where Wallingford Ave. crosses 45th Street with a jog. Besides a fine depiction of the game circles painted onto the blacktop of the school’s playfield, bottom-right, the photo shows above that across 45th the brand new grocery with a mighty ambitious name: Foodland. Foodland’s grand opening – a sign is in the window – began on Nov. 17th 1950, with a spotlight and a great orchid give-away: 500 of them. However, not everything was ready including the neon sign on the roof – seen here – and Van de Kamps bakery, which took a few days to move in. Although still medium-sized, Foodland acted like a super store. The shelves gleamed with products. There were 14 feet of self-defrosting food cases and 34 feet of self-service clear-wrapped meat. You could pick it up, squeeze it, and examine it. And most fascinating, the doors opened to electric eyes. By the end of its first prosperous decade the shining new grocery was razed for a parking lot to service a truly “super market” directly behind it with the wonderfully silly name Food Giant. For 40 years the big red neon block letters spelling FOOD GIANT extended nearly the length of the roof. It and the Grandma’s Cookies sign on Wallingford’s part of 34th Street were the neighborhood’s principal pop symbols. When QFC bought the store in the late 1990s and tried to ditch the symbol for its own, a protest from the store’s neighbors brought the compromise we see in Jean Sherrard’s “now.” By recycling seven of the old signs big letters, a new and blue sign of equal grandeur and iconic appeal took its place. It named the neighborhood. NOW: Using his pole, Jean lifts his camera higher than Ron Petty’s 18-foot bronze “Animal Storm”, the dark “totem” just right-of-center. It is the sculptor’s celebration of the 28 varieties of animals that can be found in Wallingford. 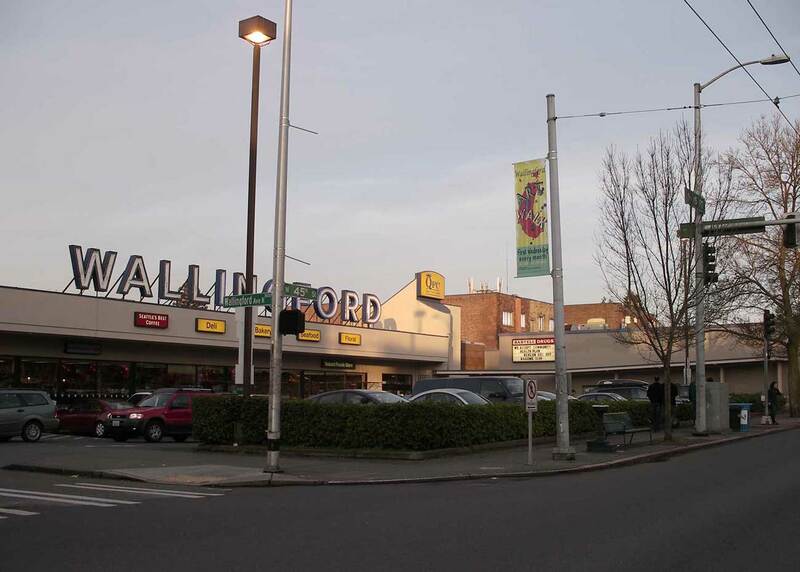 Across 45th Street is QFC’s landmark Wallingford sign. Whenever I use the extension pole to attempt a repeat, I start with a wide angle lens. This allows for a bit more leeway in framing the shot – later, I can adjust and crop to match the ‘Then’ photo in Photoshop. Below is an example of the wider angle image I start with. Jean's uncropped wide angle view of the same scene. 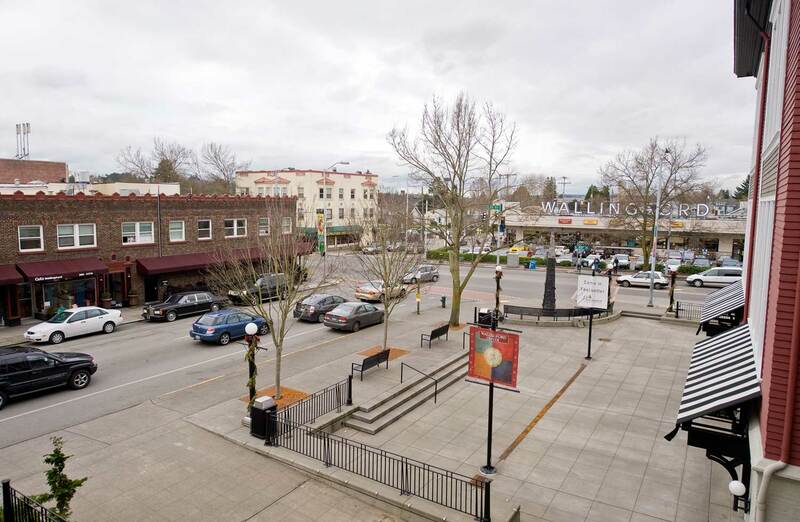 It includes the red walls of the Wallingford Center, far right, now filled with shops & restaurants. The upper floor is now divided into apartments. 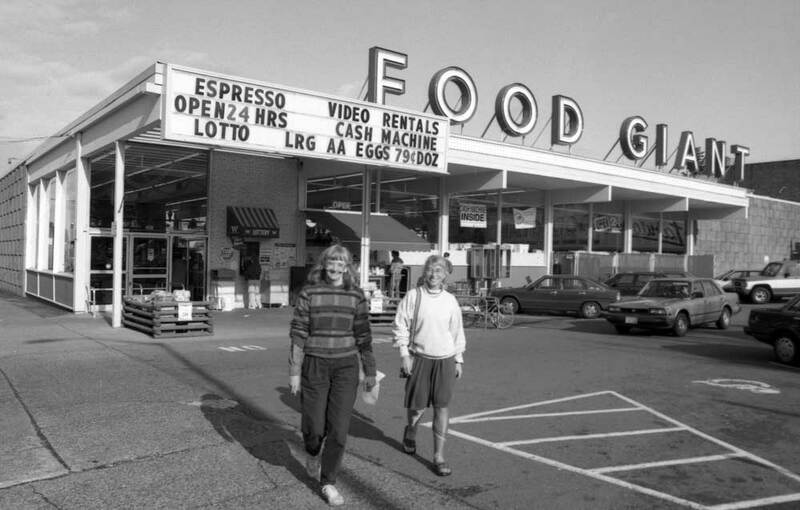 It is now – at this writing early in February 2009 – a decade and a few months (for those doing the calculations, that is a little more than ten years) since Wallingford’s commercial landmark, the supermarket named FOOD GIANT, was sold to QFC not only for a name change but also a polished make over. FOOD GIANT was more “funk and getting on” than polish. For a few – myself not included – it remains hard to imagine Wallingford without its ambitious FOOD GIANT. Even now it would not be proper to print FOOD GIANT without using all caps. This is in lingering respect for the independent supermarket’s oversized neon sign, with letters that hollered “cornucopia.” Indeed the letters were so large that they are exactly the same size as those in the “Wallingford” sign put up by QFC in its place. As the reader already knows from the story at the top, QFC recycled many of the old letters while, without missing a patriotic step, changing the color of the neon gas from red to blue. To do so was something of a citizen-pressured compromise by the food corporation – surrendering its principal blandishment, the roof top sign, to the neighborhood rather than to itself. But then it is best to get along with even the most willful of those who will buy your meat. 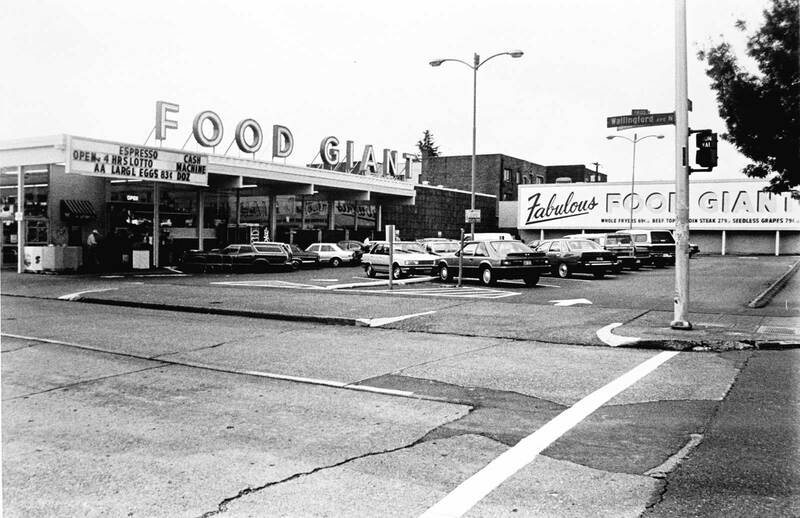 As you also know, before there was the FOOD GIANT there was, briefly, a Foodland. But first there was Wald’s Market. Frank Wald learned to cut his meat in North Dakota. A nasty fall there with a side of beef kept him out of World War II and landed him in Seattle, where he hauled stove oil to gun-emplacement camps at South Park, Sandpoint and Fort Lewis. It was important to keep the guns warm. 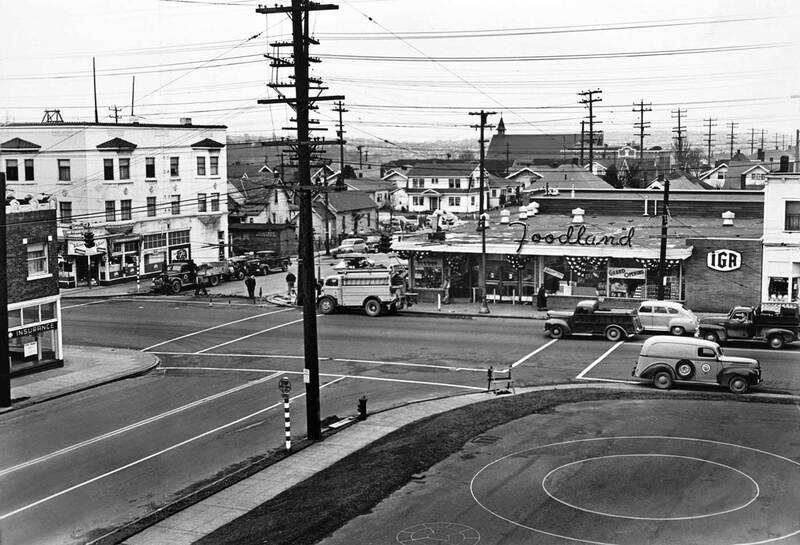 But after the war Wald returned to meat and in 1948 opened his market here at the northeast corner of 45th Street and Wallingford Avenue. His sign was about as big as his market, which he stuffed inside a converted residence. In merely two years, he moved the house off the lot and built Foodland. In this expansion Wald partnered with a Safeway dropout named Leo Haskins and together they quickly opened three more Foodlands, which they soon divided between them. 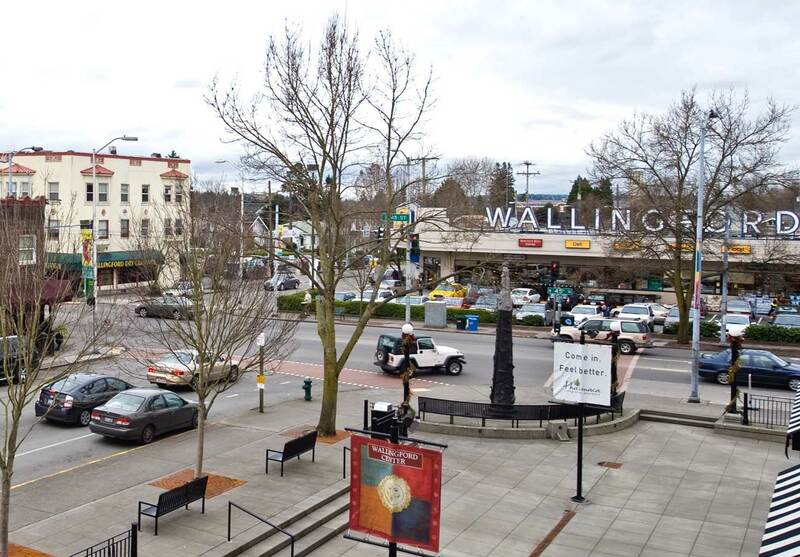 Haskin’s got Wald’s old home site here at the center of Wallingford and in the Jan 26, 1956 issue of the North Central Outlook announced his name change to Food Giant. The rest is pop-art history. A neighborhood classic. FOOD GIANT! Soon Haskins was knocking on the doors of his neighbors. He offered them prices they declined to refuse. The grocer purchased more than half the block in order to expand yet again, and this time into a plant that at least approached the sized of its name. But really the stock inside the beloved GIANT was not nearly so extended as that which would later be shelved by the “invaders” from Quality Foods. Since its take over, QFC has also been sold and perhaps even resold. We stopped counting. The accompanying photos are approximately dated. 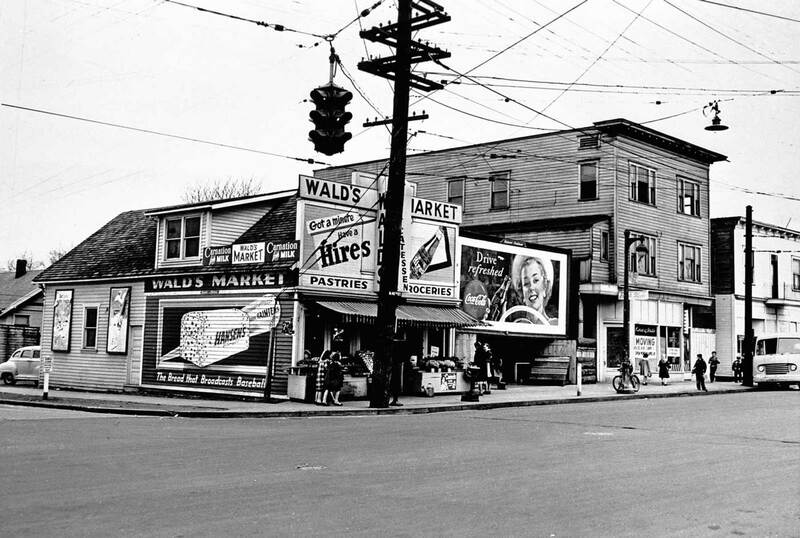 The view of Wald’s Market must be from the two years, 1948 to 1950, when it was open. The grainy snapshot of the Food Giant I took sometime in the 1980s with Tri-X film. For some reasons we liked the grain. 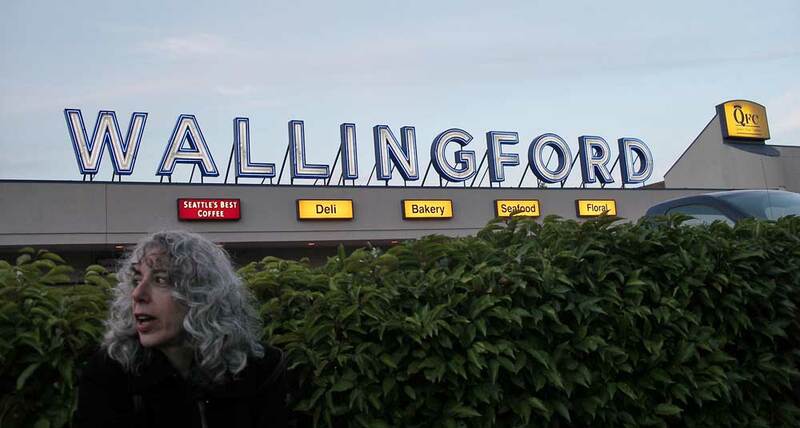 The first reader who knows car models and can convincingly date this photograph within 16 months wins a free portrait of themselves with the Wallingford Signs behind them, which we see in the third photograph. We will publish it in this blog – with permission, of course. The one with the Wallingford sign I snapped this afternoon of Feb. 7, 2009. We will also attach the free portrait prize to anyone – we mean the first dozen persons – who can identify any of those posing in the free groceries promotion near the Food Giant checking stands. We cannot date this one either, although it comes originally from Stan Stapp, the long-time editor of the North Central Outlook. If any of those in the picture step forward we will publish here in our blog a now-then of them standing at the QFC checkout stand and being handed from us a free copy of the weekly tabloid The Wallingford Journal, which we must disclose is free anyway – more the reason to enjoy the ceremony. Finally, we include a portrait of someone who may well be Frank Wald. It accompanied the picture of the market when Stan first loaned them to us. The practice of enclosing the face in a white field was once commonplace for newspapers. Of course, the rest of the photograph was then normally clipped away. Keeping the total photo intact makes the one enclosed in the mask resemble a sinful peasant or puritan being punished in the stocks. We print this to share another side of newspaper production, which all of us know is experiencing its own restrictions. Parisian Berangere Lomont - of this blog - and the Food Giant sign reconstituted as Wallingford. I prompted Berangere to walk by on 45th Street like any ordinary pedestrian during her visit here in Oct. 2006. (This is another of the several hundred "repeat spots" I often visit and record during my "Wallingford Walks". 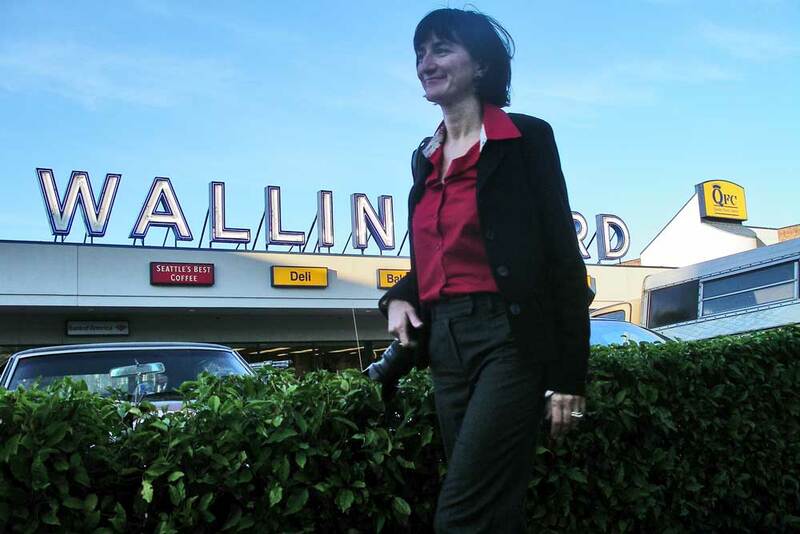 Claire Sykes crouching before the Wallingford sign atop that neighborhood's QFC market on the evening of Oct. 27, 2008. Claire helped us with the Portland Now & Then article. The four people in the picture: I know the man on the far left in the jacket is Randall West. 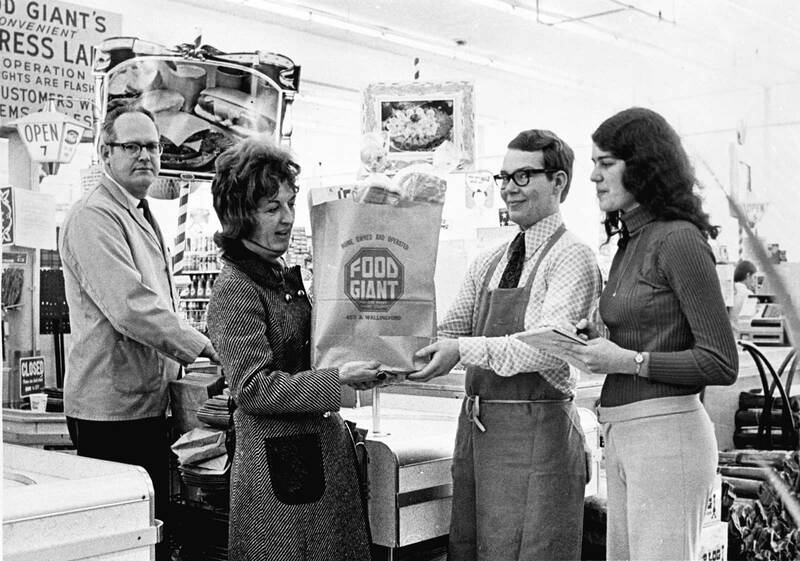 he became the Vice president and ran FOODGIANT until its last day in 96.My dad told me who the other people are but I forgot 🙁 I think this picture was taken in the late 60’s.